Chart watchers have noticed an eerie pattern – the bull market of 1982, which ended in the Black Monday stock market crash of 1987, looks way too much like the current bull market. 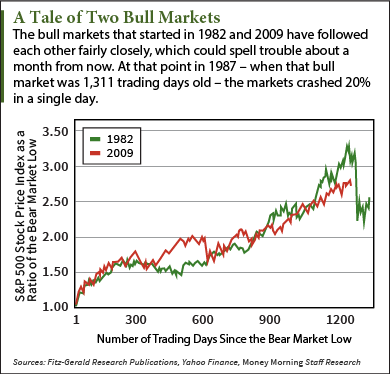 The stock market crash on Black Monday – Oct. 19, 1987 – was the worst one-day fall in history. The Dow Jones Industrial Average plunged 508 points – a 22.6% drop, while the Standard & Poor's 500 index lost 58 points for a loss of 20.4%. Such a loss today would slice over 3,200 points off the Dow and about 365 points from the S&P 500. And while no one can predict the markets for certain, the chart lines for the two bull markets have given many market analysts pause. "The bull market that started in March 2009 is now up 169% through Friday. That's nearly step for step with the rally that began in 1982," said Money Morning Chief Investment Strategist Keith Fitz-Gerald. The reason people are getting worried now is that the Black Monday stock market crash happened 1,311 trading days after the start of that bull market. The current bull market will reach that milestone approximately one month from now. But Fitz-Gerald isn't quite ready to hit the panic button. "With more than 60% of today's trading driven by high-speed computers and big dark pools that are beyond our view, another 'Black Monday' is clearly possible," Fitz-Gerald said. "Whether or not it's likely is a very different issue. The far more probable scenario is a meaningful stock market correction of 5% to 10%." That's a view shared by Jim Paulsen, Chief Investment Strategist at Wells Capital Management, who raised Wall Street heart rates by commenting on the chart pattern in a research note last week. "I would suggest that history won't repeat, I don't think we'll have a big collapse… but could we rhyme a little bit? Maybe sometime in the next several months, good news on the economy might become bad news for the market like it did in 1987," Paulsen told Yahoo! Breakout. Like Fitz-Gerald, Paulsen believes any correction would be closer to about 10%.